1 of 2 In a medium pot, combine oats, 5 cups water and salt; bring to a boil. Reduce to a simmer and cover. Cook 10 minutes. (Oatmeal will be very watery.) Remove from heat; stir in bananas, sugar and lemon juice. 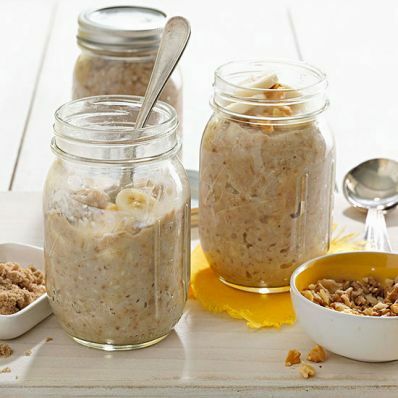 Distribute oatmeal evenly among glass jars; screw on lids. Cool on countertop and refrigerate overnight. 2 of 2 To serve: Remove metal rings and lids. For each jar, stir in 1 tbsp buttermilk, 1 tbsp chopped walnuts and, if desired, additional brown sugar. Reheat in microwave for 11/2 to 2 minutes, until hot; let stand 1 minute. Carefully remove, stir and garnish with sliced bananas, if desired. Per Serving: 8 g Fat, total, 266 kcal cal., 1 g sat. fat, 1 mg chol., 165 mg sodium, 8 g pro., 6 g fiber, 47 g carb.